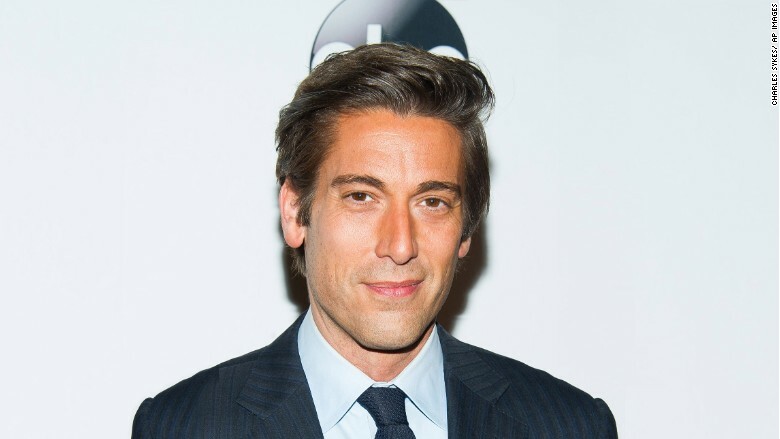 ABC's ratings might be benefiting from Brian Williams' woes, but anchor David Muir says the scandal has probably hurt the wider journalism profession. "I wouldn't wish it on anyone or any organization, and I probably would say it wasn't great for the industry as a whole," Muir told The Hollywood Reporter. Muir added, "But we try to earn that viewer's trust every single night." An ABC spokesman confirmed that these are Muir's first public comments about the Brian Williams scandal. Williams, the anchor of the "NBC Nightly News," and Muir, the anchor of ABC's "World News Tonight," had been competing in the day-to-day ratings race up until February, when Williams' exaggerations about an Iraq War mission and subsequent questions about other reporting trips led NBC to suspend him without pay for six months. Muir, who took over "World News" last fall, was the new guy and Williams was the veteran, having anchored "Nightly News" for 10 years. Muir enjoyed some early wins in the key ratings category of 25- to 54-year-olds, but in the months leading up to his downfall, Williams had taken back the lead. Now, with Lester Holt filling in for Williams, Muir has regained some momentum. Last week ABC didn't just win among 25- to 54-year-olds, it won in the overall viewers race too, ending a five-year winning streak that Williams had kept up. NBC's loss is ABC's gain, but Muir acknowledged something that many other media heavyweights have -- that a high-profile journalism ethics controversy tends to tarnish all journalists. Muir's colleague George Stephanopoulos commented on Williams' fib about Iraq in a podcast interview with Alec Baldwin last month. "I gotta say, I'm surprised -- I didn't quite understand how it got into the broadcast," Stephanopoulos said. Muir, Holt and the other 6:30 p.m. network news anchorman, Scott Pelley, are all on The Hollywood Reporter's list of "35 Most Powerful People in New York Media 2015," published on Wednesday. Holt and Pelley are not quoted saying anything about the Williams controversy. But the Reporter notes about Holt that "many of his colleagues are openly pulling for him to keep the evening anchor job."